The Wall Street Journal Says "Philippines Stands Out in Capital Markets" But UKG Asked "Paglago Ng Ekonomiya, Ramdam mo ba?" 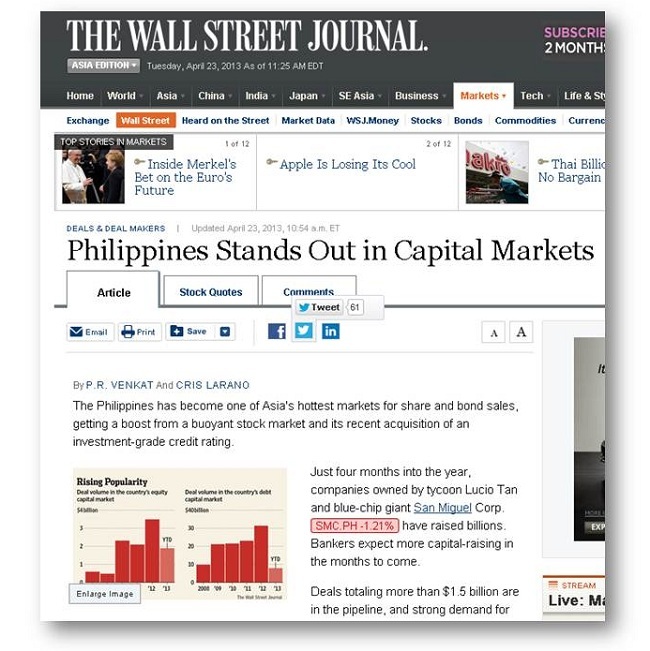 When I searched for "Philippines Stock Market" via Google News, I hopped into this business website, The Wall Street Journal. I saw the headline, The Philippines Stands Out in Capital Markets. In the news they also said, the Philippines has become one of Asia's hottest markets for share and bond sales. It's true, we're heading to a better economy. Let me just share this with you, It's just ironic that when I opened my television this morning, I heard this survey from a morning news show Punto por Punto. 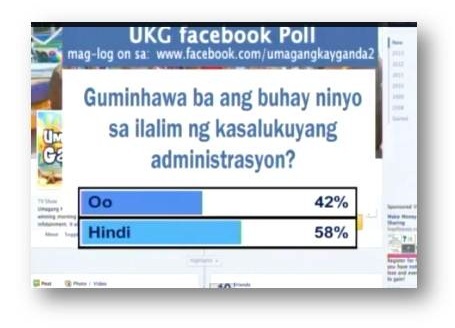 The survey was: "Paglago ng ekonomiya, ramdam mo ba?" Below is the exact result of the survey. Yes, the government has its part on creating programs to lessen the number of people below the poverty line, but it's not their sole responsibility. I think this is unfair. I think it's now time to change our mindset. Let's start educating our kababayan to change the financial mindset. Stop blaming the government or the president. Stop blaming your kapitbahay, Stop blaming the senators or Mr congressman. Naman.. let me go back to The Wall Street Journal news.... please read below. "The Philippines has become one of Asia's hottest markets for share and bond sales, getting a boost from a buoyant stock market and its recent acquisition of an investment-grade credit rating." 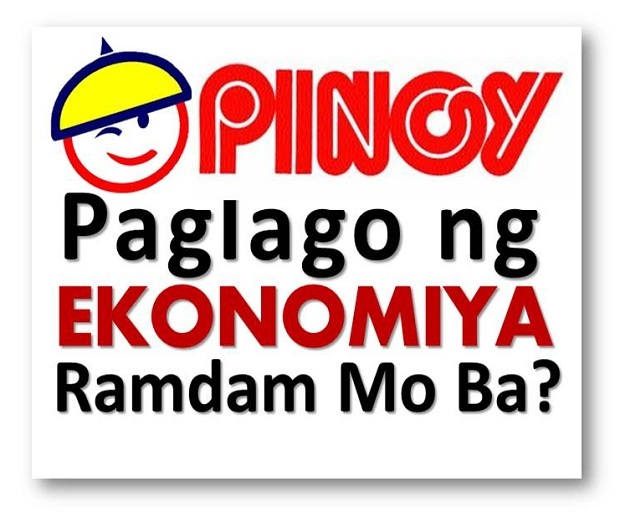 "This month, the Asian Development Bank increased its forecast for the country's 2013 economic growth to 6% from 5%. The Philippines has a population of 100 million. Last year, share sales totaled $3.5 billion, six times the $594 million raised in 2008, according to Dealogic data. Now, the country is in the third spot for equity fund raising in Southeast Asia, overtaking Malaysia, a favorite destination for deals last year. In the debt market, the Philippines is leading in Southeast Asia, with about $8 billion raised so far this year. Last year, it was third. Traditional fundraising hubs like Hong Kong have fallen behind so far this year as investors turn to Southeast Asia, where stock markets have surged on expectations of strong economic growth and rising domestic consumption. The Philippines' stock market has gained 20% this year, outperforming Indonesia's 15%, Thailand's 11% and Singapore's 3.7%. The Philippines' stock market has a market capitalization of more than $300 billion, and is dominated by family-owned businesses." "Foreign companies are also benefiting from investors' confidence in the Philppines. Apart from a $377 million share placement by Nasdaq-listed Melco Crown, which is going on now, Malaysia's Genting Bhd. 3182.KU +1.60% and its Philippine partner are planning to list a Manila casino via an initial public offering that could raise more than $500 million." I know one source of good information on how you can help other people change their financial mindset. You can share this to your relatives and friends. You can share this to your cousins. Of course, you can apply it to yourself. This is not just about stocks investing, it's about helping you become truly rich in all area of your life.